If you want to find out more about one of the most traditional livestock fairs in Andalucía, discover what a "guisillo de la Virgen" tastes like or explore the olive groves in the northeast of Malaga Province by bike, Villanueva de Tapia, in the district of Nororma, is your next stop. The variety of foods, areas of great ecological interest and a cultural tradition ranging from poetry to Holy Week, are just some of the reasons to visit this town at any time of the year. Villanueva de Tapia's history is closely linked to the Parish Church of San Pedro Apóstol. 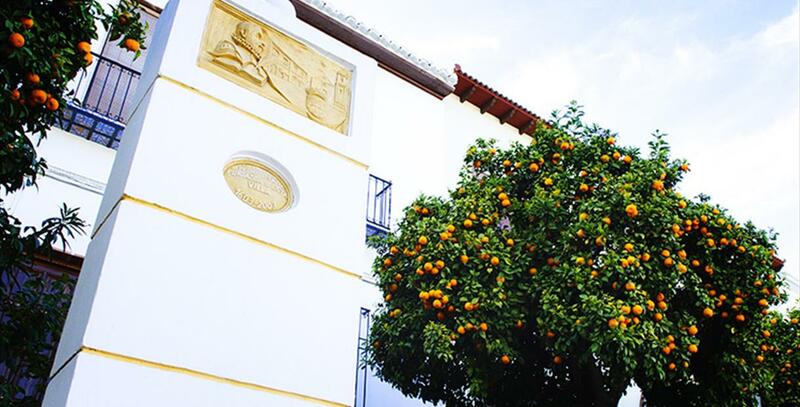 Not only because it is one of the main attractions in Villanueva de Tapia, but also because it is home to one of the most important archives in the province. Census documents, wedding and baptism certificates dating from 1626 are still kept there. The church is located in the Plaza de España and has been well conserved. Initially built between 1618 and 1624, it has undergone several renovations over the centuries: in 1778 it was extended using parishioners' money and in 1897 the façade was rebuilt (whitewashed and simple). In the 20th century, the clock was installed in 1948, and in the seventies it was covered in bricks, as it stands today. A number of valuable works of art are kept inside the church, including an Inmaculada from the 17th century and the figures of Nuestro Padre Jesús Nazareno and the Virgen de los Dolores, both from the 18th century. Another ancient point in Villanueva de Tapia is Los Allalantes Fountain, which has supplied the town with water since the start of the 18th century. A commemorative plaque hangs over the fountain to remind us of its importance: "The first to be built and which serves to supply the residents of this town". There is a reason for the river to roar. San Antonio Wash House is where the women used to meet to do their washing. The building has conserved the ancient pillars and has been converted into an Interpretation Centre dedicated to the Oral and Intangible Heritage of Humanity. We recommend you stroll through the streets of Villanueva de Tapia discovering exceptional buildings and façades which reflect the character and history of the locals, or tapienses as they are known. A pleasant surprise awaits you at the vieja posada de Santa Bárbara or Casa de la Cantina. The strategic location of the town, bordering on the provinces of Granada and Cordoba, is one of the factors that define the identity of Villanueva de Tapia. To celebrate this union, local artist, Julián Hinojosa, created a three-sided concrete monolith. Each side looks towards and represents one of the three provinces. The sculpture is on display in Trifinio. Just over 67 kilometres separate the town from the capital of the Costa del Sol. If travelling by car, it takes less than an hour to get to Villanueva de Tapia. Take the A-45 highway to Las Pedrizas port. Continue along the A-92M towards Granada and take exit A-333 to Villanueva de Tapia. 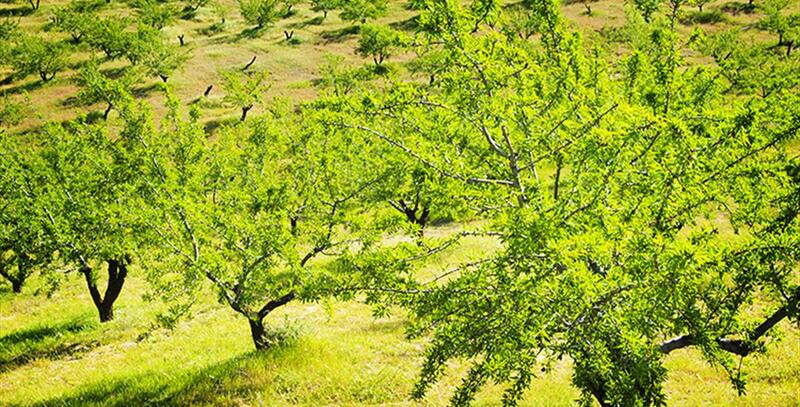 For nature lovers and active tourism enthusiasts, the Ruta del Olivar is a good choice. The route links Villanueva de Tapia with Villanueva de Algaidas, Cuevas Bajas and Cuevas de San Marcos. The path is gentle and not difficult for walkers, as the terrain in the north-eastern district of Malaga, Nororma, does not have many geographical features. As the name suggests, the green colour of the olive trees is with us all along the route. It is also possible to go by bike or on horseback. The Sierra del Pedroso lies to the south of the town. These are gentle undulating hills with a maximum altitude of 1024 metres. During the ascent, the olive groves disappear to be replaced by the original vegetation of the area: gall oaks, cork oaks and Holm oaks. If you are lucky, you may see some of the foxes or wild boars that live in the area. Villanueva de Algaidas is also on the Great Malaga Path. It is reached from stage 13 which starts in Archidona, and is the starting point of the next stage which covers the entire province. Stage 14 is 16 km long, and takes approximately 4 hours. The route starts on the north face of Sierra del Pedroso and in the last section descends through an olive grove to Villanueva de Algaidas. A singular event takes place in mid-July, the International Festival of Poetry Recital. This meeting of arte trovo and improvised poetry attracts international troubadours, including participants from Cuba, Argentina or Mexico. It is a good opportunity to discover an art that has existed since the Middle Ages while enjoying pleasant summer evenings in the open air. The festival takes place in Plaza de España and admission is free. The importance of oral tradition is not only evident at the Festival of Poetry Recital, but also in December when the tapienses celebrate the Fiesta de los Porqueses, a celebration combining verse and the picaresque. Almost all the fairs held in Spain originate from the ancient livestock fairs. However, this tradition has gradually been lost throughout the country. To discover one of these fairs, make a space in October for a visit to Villanueva de Tapia. The Real Feria de Ganado (Royal Livestock Fair) or Feria Grande (Big Fair) has been held since 1869, and is one of the oldest livestock fairs in Andalusia. As well as the animal market, the fair has donkey and oxen shows, a gastronomic event involving suckling goat from Malaga, musical performances and the famous competition of Andalusian Goat Breeds of the District. And if there is a Big Fair, it's because there is also a Feria Chica (Little Fair). This is the Feria de San Antonio and takes place in the second week of June. Holy Week is another of notable date in the town's calendar. However, unlike other towns, the celebrations in Villanueva de Tapia start before the Paso. A play portraying the life and death of Christ is performed on Lazarus Saturday. If you visit the town during Holy Week, you will witness the devotion of the tapienses to the figures of Jesús Nazareno and the Virgen de los Dolores. The Candelarias, Carnival, San Marcos and the Cultural Week keep the festivities in Villanueva de Tapia alive throughout the year. In addition to exquisite pork sausages, salmorejo (which in this case is an orange and cod salad), papuecas (omelettes usually filled with cod) and guisillo de la Virgen, are some of the typical dishes served in Villanueva de Tapia. With such a strange name, guisillo de la Virgen (Virgin's stew) is a stew made with fresh anchovies with saffron, lemon and parsley. We also recommend the porra de chivo (a strong spicy goat stew), migas (dried bread fried with garlic, and cured meats, peppers, sardines, and other ingredients) and ajoblanco (cold garlic and almond soup, which in this case is combined with beans). For those with a sweet tooth, olive oil buns, piñonate (a mixed nut brittle dipped in honey), roscos de pichi and wine, pestiños or the typical Spanish Christmas biscuit. Villanueva de Tapia has been at the crossroads of travelling men since prehistoric times. Lithic evidence and polished stone axes in the area of Llanos de la Laguna points to the presence of man since time immemorial. The area was then colonised by both the Romans and the Arabs, but the village that has come down to us dates from a later period. After the Christian Reconquista, these precious lands were coveted by Archidona (Málaga) and Iznájar (Córdoba), both of which wanted them under their jurisdiction. This earned Villanueva de Tapia the nickname "El Entredicho" ("the argument"); there are documents from the sixteenth century referring to it thus. To bring matters to an end, the councillors in the Royal Treasury decided in 1602 that the lands should become part of the King"s estate. King Philip III, however, thought them to be valueless and sold them to Pedro de Tapia, who was a member of the Higher Council of Castile. A population centre evolved out of them under the patronage of the Counts of Tapia. The Parish Church of San Pedro Apóstol was erected in the seventeenth century, while the Allalantes Fountain, supplying the village with water, emerged in the eighteenth century. Today, they are two of the most popular sights in Villanueva de Tapia, a village in the north-eastern part of Málaga Province drawing lots of country and nature travel fans.